“Besides lava flow, most standard homeowners, renters and business insurance policies provide coverage for property loss caused by volcanic eruption when it is the result of a volcanic blast, airborne shock waves, ash or dust. Fire or explosion resulting from volcanic eruption is also covered. Homes and businesses that have been looted after evacuation, are covered for property damage, vandalism or theft,” (Hawaii Homeowners, Renters and Business Owners Have Coverage for Lava Flow Damage, Says I.I.I. : Insurance Information Institute, October 30, 2014). Insurance policies may not be anyone’s desired reading, but policyholders who do not read theirs may be caught unaware when their house is damaged by certain natural hazards. The insurance company will likely deny their claim immediately, because those perils are not covered under the purchased policy. Homeowners can prepare by purchasing specific insurance policies to cover perils such as floods or earthquakes, says Darras. “Your insurance agent will be able to give you a more in depth summary of what will be covered in the event of a natural disaster. This could be a volcanic eruption, a hurricane or even a mudslide. Your agent can help you assess what type of damage could potentially occur based on where you live. Therefore, you can prepare your policies and also your home for whatever life may throw at you. Know what the geologic risks are where you live and buy your insurance policies accordingly,” says Darras. 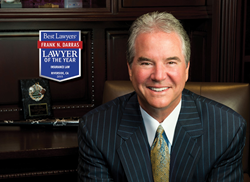 Frank N. Darras is available for interviews. Contact Robin Nolan at McDavidPR or call 919-745-9333.